A true symbol of high status, success, and prosperity, gold is a luxurious, highly desired precious metal. However, even if you own a stamped gold piece, its hallmark isn’t a guarantee of its real gold content. This article reveals you the best testing methods on how to perform a proper gold test. Remember that you can always get a free top-notch appraisal from our expert NYC Bullion team. Since gold is sectile, it also needs to be alloyed with other metals. Its alloys are measured using either the Karat system or the Millesimal Fineness System. One Karat unit is equal to a 1/24 part of pure gold in an alloy while the millesimal purity is indicated by parts per thousand of genuine gold by mass in an alloy. Take a look at the below gold purity chart for more details. To find out whether your gold jewelry or bullion piece is fake or genuine, use the following gold testing methods. Home methods will help you easily test for real gold while professional tests will reveal the exact fineness of your piece. any signs of discoloration – gold doesn’t react to any environmental factors. So, if your piece has discoloration marks, it’s either not gold or gold plated. color and shininess – pure gold is not very shiny and has a nice soft yellow color. Any shiny, yellow or toned(reddish) item is definitely not pure gold. The second step is the hallmark test, for which you may also need a magnifying glass. Look for any gold hallmarks or jewelry hallmarks (inside the surface or near the clasp). 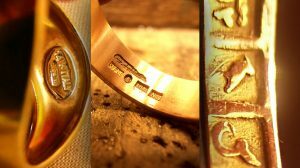 These markings must show at least the gold’s purity (in millesimal fineness or Karats) and, if selling jewelry, it can also be accompanied by the manufacturer’s stamp. Beware of “HGP,” “GF,” “HEG,” “GP,” “HGE,” “RGP,” “GEP,” or ”GP” hallmarks because they all mean that the item is gold plated. Also, avoid fake “800,” “925” or “950” marks on gold pieces since these are all silver hallmarks. The hallmark test isn’t 100% accurate and shall be used only to identify if the gold is not genuine or pure. If your item is marked as gold, but you’re still in doubt, proceed with further testing. 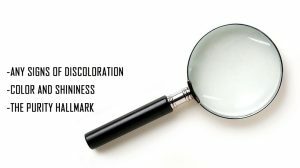 The skin discoloration test is one of the easiest ways to test gold at home. Just hold your gold piece in your hand for a few minutes. Real gold doesn’t leave any spots or stains on skin, so if you notice a black or green chemical reaction with your perspiration, then it’s certainly an alloy. However, keep in mind that if you apply powder or liquid foundation on your tested skin area, a real gold item might leave a black streak on it, so your testing won’t be precise. Therefore, before performing the gold test, please ensure that you aren’t wearing any makeup and your skin is clean. 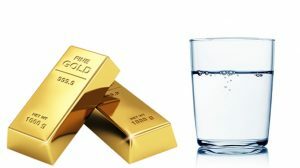 Another easy method of testing gold jewelry or bullion at home is the float test, for which you need to place your gold piece in a cup of water. Due to gold’s high density (19.32 g/ml), pure gold will immediately sink to the cup’s bottom. Fake or plated gold will hover or float above, while gold alloys will tilt up halfway. Also, if your piece will rust or discolor, then it’s fake. However, please consider that a fake item could consist of other heavy metals which also sink. So, use this test to spot fake gold that floats or hovers. If your item sank and you still have doubts, take another test. The porcelain tile test, also known as the gold scratch test, requires a ceramic plate or a piece of unglazed porcelain tile. Scratch or rub your gold across the tile/plate and take a look at the color of the streak. 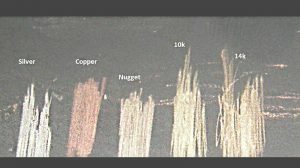 A golden, yellow streak indicates real gold while a black streak shows that your item is fake or it’s pyrite. If you don’t want to damage your gold piece, consider using other harmless testing methods. 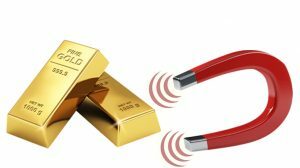 One of the easiest and most convenient home gold tests is the magnet gold test for which you need a high strength magnet. This solution is cheap and portable since a magnet is accessible anywhere and anytime. Because genuine gold is not magnetic, it won’t be attracted by the magnet. Gold allows or fake items will instantly attract the magnet while slightly attracted pieces are more likely gold plated. Also, keep in mind that jewelry pieces usually have strength elements (like wires, clasps) which aren’t made from gold and can be magnetic. Thus, if the magnet attracted your item, you can skip the following tests. Otherwise, it’s likely pure gold, and it may need further testing for a higher accuracy. Also, remember that other precious metals (like silver) are also non-magnetic, so make sure to perform additional testing to certify that your item is real gold. 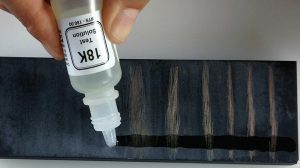 If you don’t mind damaging or scratching the samples, you can apply the gold acid test. You need to purchase a gold testing acid kit (for each Karat), a black gold testing stone, gold Karat needles and 2 glass beakers. One beaker with baking soda/water mix and other just with water. Before testing gold with acid, be sure to choose a well-ventilated area and to take all the safety measures for protecting yourself and your working area from any contact with the acid. Each bottle from the acid kit is a distinct mixture of nitric acid and other components. Take your gold sample and scratch a slight line on the black stone, making sure you’ve reached over any potential plating. Mark your line and make similar parallel lines with the other gold Karat needles. Then take the lowest karat acid and apply its content across or on each line and wait for 30 seconds. Wash the stone in the baking soda/water mixture then rinse it in water and pat it with a paper towel. A reaction (dissolved line) shows that your sample has a lower purity, a slight reaction means that you’ve matched the Karat while no reaction indicates that you have a higher Karat gold. If your sample didn’t react, repeat the test steps with the next acids until you match the Karat. If the last test acid in the kit is for 22K and you need to know whether your piece is 23K or 24K, you should use gold testing machines. 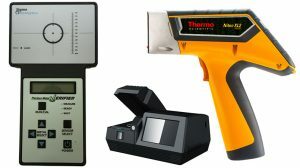 The most harmless and accurate testing methods are the XRF thermo and electronic gold testing machines, such as the Sigma Metalytics Precious Metal Verifier and XRF Thermo Scientific Analyzer. This device performs gold test for bullion and jewelry without using chemicals or damaging them. It uses electromagnetic waves to determine the Karat of your item based on gold’s electrical characteristics. The waves penetrate deeply into the tested piece, ignoring its surface and assessing its body, then displaying the result in a few seconds. The Sigma Metalytics electronic gold tester comes with various sized sensors for each gold sample. 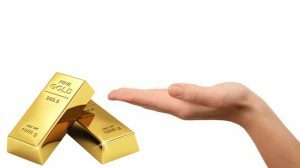 Moreover, if you want to sell gold coins or any other gold bullion that is encased, you don’t have to remove them from their protective holders. Just place your sample on the corresponding sensor, select the expected purity, wait for the “Ready” message and press “RUN/CAL.” If the result is between the brackets, your tested piece matches the selected fineness while an up arrow indicates that your piece is not gold. It’s the most expensive precious metal tester, yet the most accurate and nondestructive one. This gold analyzer uses X-ray fluorescence (XRF) spectrometers to test the gold piece. The device sends X-rays through the sample and makes atoms get momentarily excited, moving them into a higher energy state. When the atoms return to their ground state, they release radiation which is detected and read by the machine. The machine returns the exact Karat or metal composition of the tested piece. It also comes with a unique AuDIT™ gold-plating detection technology which alerts you if the tested item is gold plated. The best and easiest testing method when selling gold is to get analysis and evaluation by professional appraisers, like NYCBullion. Our team uses high-class digital gold testers, including the Sigma Metalytics Precious Metal Verifier and XRF Thermo Scientific Analyzer. Along with our top-notch expertise, we guarantee a free, fully transparent appraisal of your goods and the most generous quote on the market. You can get your free evaluation from NYCBullion either by sending your gold item or by visiting our store. For any questions, just call us at (212)-354-5557, message us, or, come to our retail office at 32 West 47th Street, Booth 41, New York, NY 10036.